This powerful vehicle is meant to transfer small groups, friends, corporate partners and family members seamlessly to their special tours. The Standard Chesterfield Minibus Hire version is a Ford Transit, and we also have an Executive Hire that involves the high-class use of a luxury Mercedes vehicle during corporate events and travelling in elegance. 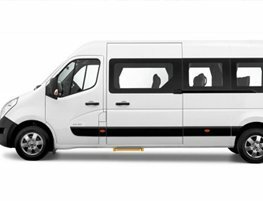 When you book the 16-Seater Chesterfield Minibus Hire package, you will be able to enjoy a vehicle in its prime, fully equipped to give you comfort, efficiently designed, space-saving capacity in mind, and loaded with state of the art technology. All our vehicles are not older than six years, and most of them are relatively new. Come to us and ask any questions you may have concerning the specific vehicle you will be booking. The 16-Seater Minibus Hire Chesterfield package was specifically designed to carry small groups that need a stable and efficient vehicle to get them from one point to another. Our Executive hire clients can also enjoy the luxurious interiors and modern fixtures, suitable for carrying small groups to corporate events. Ensure a prompt arrival for family, friends or business partners with Chesterfield Minibus. To book the 16-Seater Minibus, check out our price quote or talk to our agents at the Chesterfield Minibus team. You can also use the form on the Contact Us page of our website today.